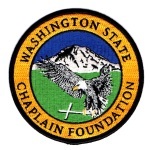 Mike Neil is the President and Founder of the Washington State Chaplain Foundation, and Senior Chaplain for the Washington State Patrol and the Department of Fish and Wildlife. He served 30 years as a Fish and Wildlife Officer, 15 years as a Police Firearms Instructor, and 16 years as a Police Dog Handler. He is the author and illustrator of an African adventure novel, The MIRACLE of AFRICA, He is a born-again Christian who has been married to his wife, Susan, since 1973. In 1981, the couple lost their son Ryan, who was born three months premature. In 2006, the Neil’s faith was tested when their 27-year-old daughter, Susanne, died after being struck by a car on her bicycle. Mike ultimately decided to accept his loss as part of God’s plan and use it for a greater purpose. Today as an Ordained Pastor, Neil leads a statewide team of Police Chaplains who respond to tragedy and minister to state employees. The Neil’s reside in Gig Harbor, Washington where their son James, his wife Heather and their two children also live. James is an Elementary School Principle in Tacoma. Sue retired in 2015 after 27 years teaching fifth grade in Puyallup. Dr. Tom Jonez serves the Gig Harbor area. He is currently President/CEO of Plumbline Management & Plumbline Media Group, Tom is a strategic management and market-expansion consultant, and oversees a growing media services team that has produced award-winning content for numerous clients. Tom’s background includes over thirty years’ experience both in developing and by providing leadership to businesses and to non-profit organizations. Tom has an earned Doctorate degree in Strategic Leadership, with an undergraduate degree in Communications/Broadcast Journalism. 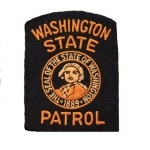 He also participates on the Washington State Department of Emergency Management team where he serves as a Ham Radio communications volunteer. Raised in the Pacific Northwest, Tom and his wife currently reside in Gig Harbor, Washington. Paul Criss is the Chaplain in Grays Harbor County and lives near Ocean Shores. His son is a Police Officer and Paul has a heart to help officers get through their careers. Paul is a retired U.S. Army Nurse and has been an ordained minister working overseas as a missionary. 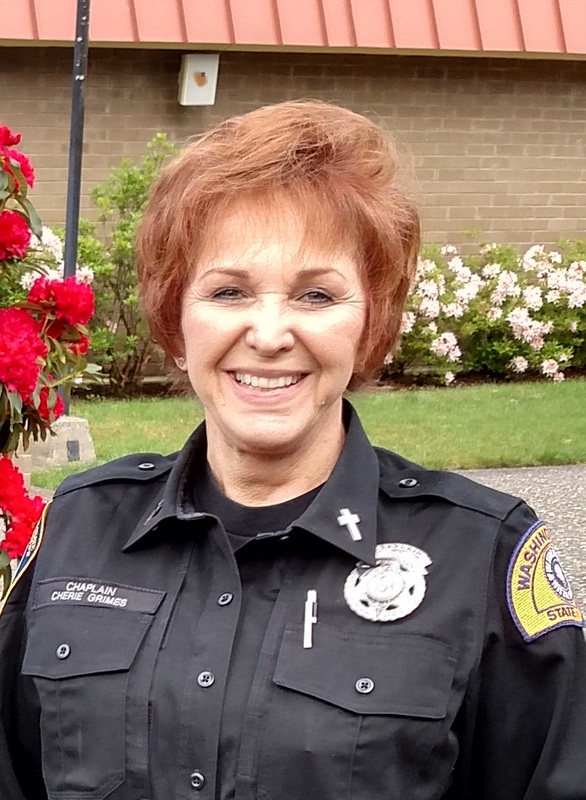 Chaplain Cherie Grimes serves in Pierce County, District 1 with the Washington State Patrol and Region 6 with the Department of Fish and Wildlife.Cherie, a native of Everett, WA, joined the US Army and served both in the US and overseas. Serving both regular and reserve assignments. Cherie is retired from law enforcement after 28 years in California. She worked patrol and finished her career in forensics. Cherie is married to Bob Grimes, a chaplain for Pierce County Sheriff and Gig Harbor Fire Department. Bob was a fireman and is a retired police officer from California. He also retired from the US Army as a Lt. Colonel. They have three sons, one a sergeant with LAPD, one in college and one living in Arizona. Hobbies include, flying, bow and pistol shooting and soon to be RV owners. Cherie said, “It is an honor to give back and serve those still fighting for us. With GOD’s help I will take my experiences in order help others. 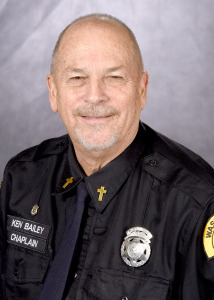 Chaplain Ken Bailey serves in Kitsap County. Ken has been married to his wife Bobbi for 50 years. 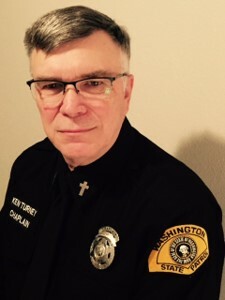 He has been a chaplain in Kitsap County since 2007 serving Poulsbo Fire and Police and the Kitsap County Sheriff’s Department. 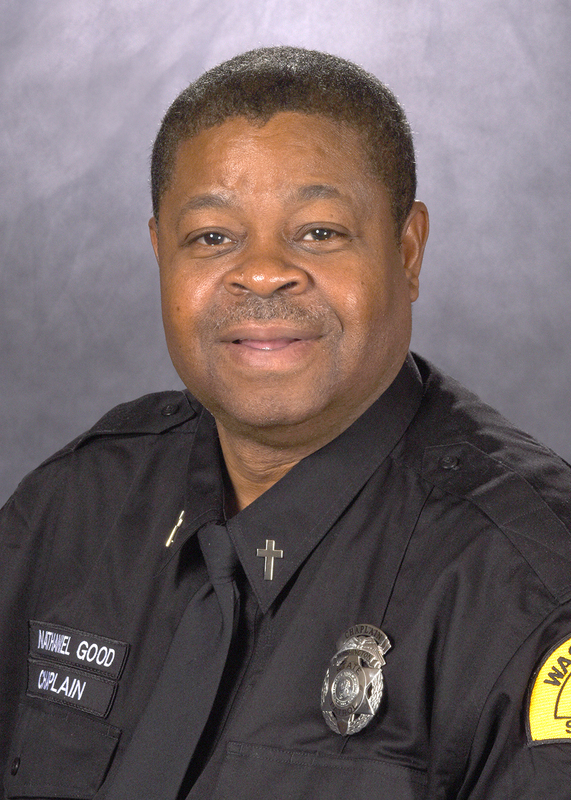 Ken has been an ordained pastor since 2004, and is a graduate of the Chaplain Police and Fire Academy in 2007. Bobbi is a Fire Chaplain in Poulsbo and they often go on calls together. They have four grown children and four grandchildren. 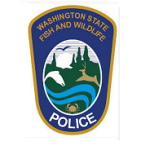 Chaplain Preston Devers serves in Pierce County in District 1 with the Washington State Patrol and Region 6 with the Department of Fish and Wildlife. 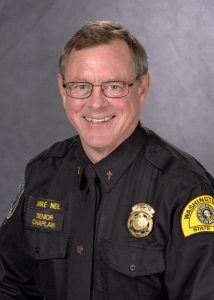 He is an ordained minister, member of the Board of Elders, and Head of Security at Our Savior Lutheran Church. He also functions as the President of the Board of Directors for Curran Road Mutual Water, is a High School basketball referee, and is an advanced prayer counselor through Puyallup Nazarene Church where he has been a teacher for the “Living Free” training course. After graduating from Beaverhead County High School in Dillon, Montana, Preston joined the Navy and was stationed on two submarines until he was honorably discharged in 1989. In business for 27 years, Preston is the owner of Inline Northwest LLC, a general contracting company as well as owning Holy Acres Feed Resources, which sells grain and hay for chickens, cows, swine, goats, sheep and horses. Preston enjoys spending time with his best friend and wife, Theresa. Together they have three sons, one daughter and three grandkids. Their hobbies include golfing, salmon fishing, ATV riding, camping, hiking and other outdoor activities. 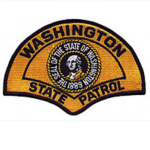 Preston will continue to serve as a Chaplain in a loving, caring and confidential manner to serve with the utmost and highest regard for the Troopers and Fish and Wildlife Police. Preston currently lives in Tacoma Washington. Chaplain Devers is a former Chaplain of the Year for WSCF. Chaplain Flip Eiland has served with Cowlitz County Police, Fire & EMS Chaplaincy since 2008. He is a graduate of the Police & Fire Chaplain Training Academy. He and his wife Crystal have been married for 44 years. They have a son and daughter who also live in Longview. Their son Jason is a police officer for the City of Ridgefield. They have two grandchildren: Jessie, a student at WSU, and Alex who is in high school. Flip was ordained as a Southern Baptist Minister in 1985 and has served as a bi-vocational pastor in both California and Washington. He has been an active member of Cowlitz County Search & Rescue since 2003 and is a Chaplain/EMT at Fire District 6 in Castle Rock. Flip works full time for Georgia Pacific in Oregon. 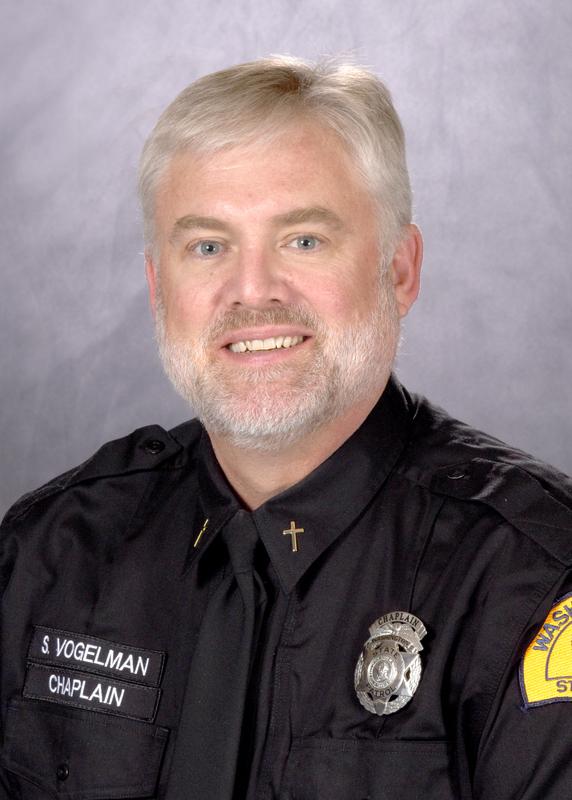 Chaplain Stuart Vogelman was born in 1961 and raised in Spokane. He is a graduate of University High School in 1980, and has his Bachelor of Arts Degree in Marketing from Eastern Washington University and a Master of Health Service Administration Degree from Whitworth University. Stuart’s corporate career spanned 20 years in both the health care and high tech industries. During that time, his experience as a senior executive and consultant included the areas of sales, marketing, advertising, company start-up’s and consulting. He worked in countries throughout Europe, Africa, the Nordics, South and North America and the Mid-East. Starting in 2000 Stuart formed and ministered nationally though his para-church ministry called Pure Warrior Ministries. Stuart served as Executive Pastor at Valley Real Life in Spokane ministering in the recovery as well as security, medical, ushering, and transportation. He has expertise in the areas of addictions, depression, marriage, divorce, grief, as well as emotional, psychological and sexual trauma. Stuart lives in Mica with his wife Juleen and three teenage sons. Chaplain Mark Hoeffner has been married to his wife Janell for 34 years. Mark has a long history of pastoring CB (Conservative Baptist) churches after graduating from Western Conservative Baptist Seminary. He is currently the Executive Director of CB Northwest, the regional office covering Oregon, Idaho, Washington, and Alaska. Their offices are located in Portland, Oregon. Mark and his wife have one biological daughter and have adopted six special needs kids. Mark is currently the Teaching Elder at Grace Church in White Salmon along with his role at CB Northwest. Chaplain Rick Karjalainen has been married to his wife Debi for 40 years. He has been the senior pastor of Coupeville Community Bible Church for the last 12 years. 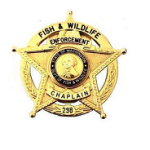 He is the supervising chaplain for the Island County Sheriff’s Office where they have eight volunteer chaplains in the county covering all the first responders and the county jail. Rick and Debi have four grown, married children and 11 grandchildren. One of their sons is a Professional Firefighter/Paramedic/Arson Investigator for the Port Angeles Fire Department. 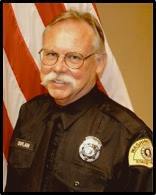 Rick spent 10 years as a Professional Firefighter and Fire Marshal. 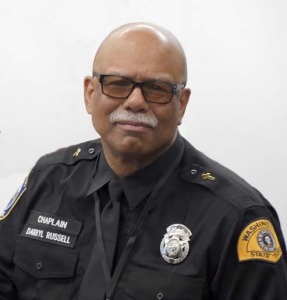 Chaplain Darryl Russell retired as a WSP Detective in 2001 and as a King County Metro Transit Safety Superintendent in 2016. Darryl is an Ordained Minister and brings a wealth of knowledge and experience to our Chaplain Program. He and his wife Dolores have been married for 23 years. The Russell’s have five children and 12 grandchildren. Darryl graduated from the Police and Fire Chaplain Training Academy in May 2012. 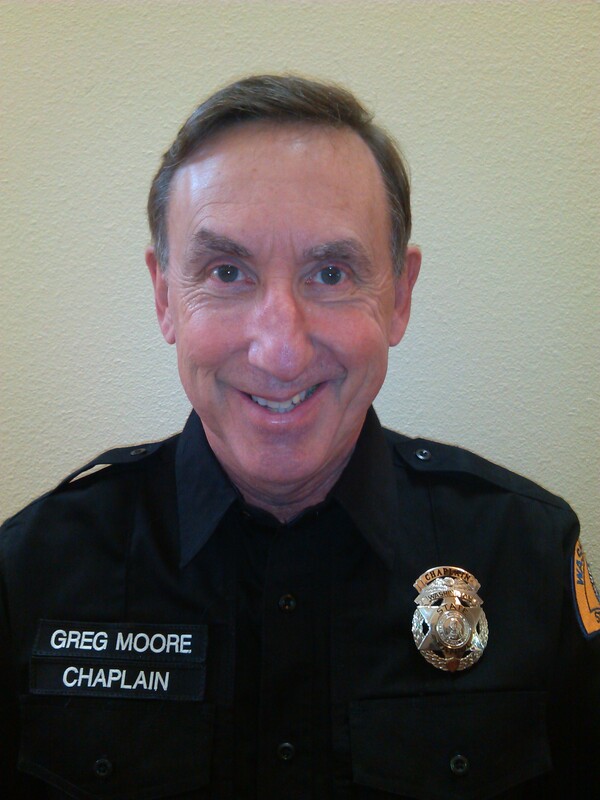 Chaplain Moore is a former WSCF Chaplain of the Year. 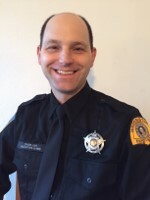 Chaplain Nathaniel Good serves in the Auburn area of King County. Chaplain Tim Snyder works full time for the Washington State Department of Corrections as a chaplain. Tim and his wife Sena have been married for 27 years. They have three children: one is in college, and two with special needs are still in high school. Tim graduated with a Bachelor of Arts from Northwest Nazarene University in 1984 and received his Masters of Divinity from Nazarene Theological Seminary 1991. Tim has been a volunteer chaplain with the Royal City Police Department since 1997. He is the former senior pastor of the Royal City Church of the Nazarene. Chaplain Purdy is a retired Air Force Officer with eight years of experience as a medic/EMT and fifteen years as a healthcare administrator. He served twelve years as the Ministry Coordinator Crossover Church in Mead, WA. He serves as a Chaplain for the Billy Graham Rapid Response Team ministering to victims of disasters where he has deployed to Houston for hurricane Harvey in 2017 and North Carolina for hurricane Matthew in 2016. He has his Associate Degree in Nursing, Bachelor of Science in Healthcare Administration and a Master’s Degree in Management. Chaplain Purdy is a Graduate of the National Police and Fire Chaplains Academy in Spokane, WA. He has certifications and advanced certifications in Critical Incident Stress Management as well as multiple certifications in the Incident Command System. Bob lives in Colbert, Washington with his wife Nancy. 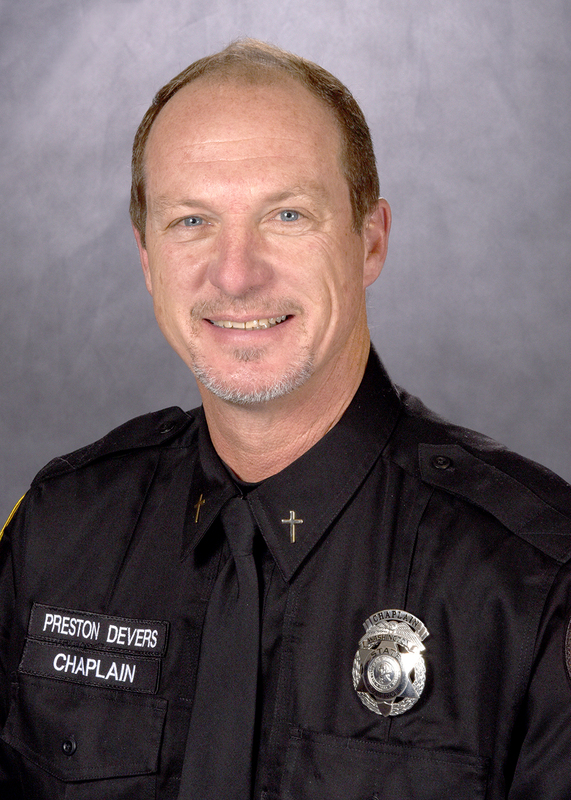 Chaplain Purdy is the Registrar for the National Police and Fire Chaplain Academy. Chaplain Olsen became a chaplain 15 years ago and served alongside Chaplain Martin Redman while living in the Issaquah, WA area. 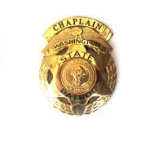 He also served as one of the on-call chaplains for WSP District 2 and the Issaquah Jail prior to the creation of the WSP/WDFW chaplaincy. While studying at Fuller Theological Seminary he underwent pastoral internships in Jakarta, Indonesia and Beijing, China, coincident with his day job of Director of Engineering for the Motorola Cellular Infrastructure Group in those two cities. Dr. Rick studied electrical engineering at Arizona State University, and received an MBA and PhD at La Jolla University in Southern California. He also earned a Masters in Biblical Studies and Theology from Fuller prior to his ordination in March of 1999. 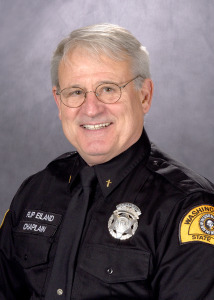 Chaplain Tom Durrant comes to us with 37 years of ministry experience. Tom and his wife, Susan served side-by-side in ministry where they ministered in the prisons of California and Colorado before moving to Washington where they ministered in the business and political community. Tom also served on covert probes into Poland and Russia during the Communist years. This later led to the establishment of the International Leadership Academies in Mexico, Costa Rica, Nicaragua (with students from Cuba), Russia, and Belarus. 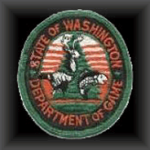 Tom and Sue later directed the Inner City ministry for Seattle, where they established special projects for university students to intern with the Washington State Department of Corrections. Then in 2015, Tom’s wife died, and although the loss of Susan is deep, this has also uniquely qualified Tom to minister to others who are also experiencing such loss. 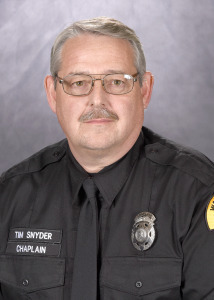 Tom relinquished his career with Campus Crusade in February of 2016 and has joined our team of Chaplains in order to serve those in law enforcement. Jason Williams is licensed with the United Pentecostal Church and is an associate minister at the Olympic Christian Center in McCleary, WA. Jason and his wife, Shawna have been married for 18 years and have 3 children. Jason works for a manufacturing plant in Montesano as a journeyman welder. 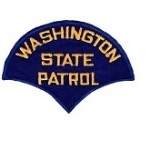 He serves as a chaplain in district 8 for the WA state patrol and region 6 for the Dept. 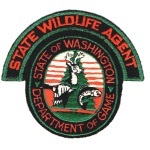 of Fish and Wildlife in Grays Harbor County.